It is no secret that businesses will be entering an uncertain year in 2013. No one rally knows what the tax rates will be, how much health insurance will really cost, or how it will impact consumer spending on everything else. Smart businesses will get as lean as they can before this period of uncertainty becomes a period of certainty and it is too late to adapt quickly. One of the things you can cut in 2013 that will save you a bundle of money is your old, outdated Yellow Pages advertising. Where is Your Phone Book? Ask yourself a question… Where is your most recent phone book? Do you have it? Do you use it for anything other than a booster seat at Thanksgiving dinner? 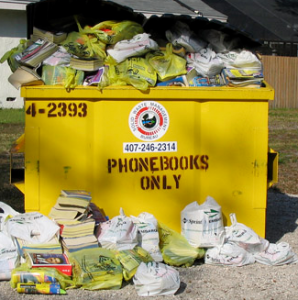 If you do have a recent phone book, when is the last time you genuinely used it to find anything important? The truth is that the Internet is so widely available on such a wide assortment of devices it is actually faster to Google your local Pizza Hut on your smartphone, tablet, or laptop than it is to locate the phone book and look them up. Like the buggy whip, the typewriter, the floppy disk and the Polaroid camera, the Yellow Pages was huge in its time, but is now nothing more than a novelty that collects dust somewhere or ends up in a landfill. As fewer and fewer people with disposable income use the phone book, its benefit to your organization decreases dramatically – more than likely past the point where it makes fiscal sense to pay to play. What Does Disposable Income Have to Do With Yellow Pages Advertising? Demographics and disposable income are the two most important statistics in Yellow Page advertising. A second statistic that might be more useful from the same survey indicated that 70% to 84% of those age 54 or younger use the search engines FIRST. They may end up on a yellow pages website eventually, but they start their search with Google and not yellow pages.com more than 75% of the time. The only demographic who used the search engines less were those ages 55+. Usage of search engines drops to an average of about 42% while the use of the printed book or direct links to the yellow page website held steady. Assuming that these customers were adverse to using the search engines, it is safe to assume if you are looking to reach customers aged 55+ who do not have a relationship with an existing top-of-mind vendor you might get some traction with the printed yellow pages in your area, depending on industry. With that said, that doesn’t mean that the yellow pages is a lock for reaching those 55 and older (who coincidentally are responsible for 55% of all package purchases and have 75% of the nation’s wealth (source). By themselves these numbers indicate that retiring Baby Boomers are using technology to get information and that necessarily means they are using the printed yellow pages less and less. The most shocking fact that should have yellow page sales reps quaking in their boots is the rate of Internet adoption by boomers. Consider the fact that from 2004 to 2009 the number of 65+ internet users increased 55%. The web is only going to get more popular and that necessarily means the printed yellow pages will become less and less popular. In 2011 Schrock Innovations Computer Company took out a yellow pages advertisement in the Dex phone book in Omaha, NE. The advertising bill came in at $1,600 per month. We asked for a metered phone number so we could track the results of our ad through Telemetrics. At the end of the year our final Telemetrics report indicated that we had received 24 phone calls for the entire year. Assuming that the same person did not call twice, that breaks down to a cost of $800 PER LEAD!! Those were not confirmed customers – those were just leads. For all I know they could have been wrong-number hang-ups. You ad could be performing just as bad as our ad did, but how would you ever know? Without a metered number you simply can’t track yellow pages leads. Business owners who can’t track results desperately want to believe that $1,600 a month was not wasted. There must have been SOME results that helped our company, right? The answer is probably not. We would have probably gotten more use out of our $19,200 if we stacked $20 bills in our bathroom and used them for toilet paper. Sad but true. Don’t make the same mistake I did. Although Schrock’s experience would indicate the yellow pages are a bad bet, there are areas where the yellow pages are more effective than in others. If a business pulls out of the yellow pages and does not do something else to replace the lost leads that business may be more profitable, but revenues will go down. Revenue is cash flow and in a tough economic year falling cash-flow can be a problem. The answer is to shift your marketing dollars away from yellow pages and then refocus a much smaller spend to get better results using the new medium that everyone is rapidly adopting. Go where the eyes are – go online. Don’t get me wrong, Google AdWords is expensive and doesn’t really work for every industry. That’s why we recommend avoiding any ad or placement buying scheme that guarantees your ad will be seen. First of all, it is just as expensive as the print yellow pages if you add up the overall costs of maintaining the ad. Secondly, why pay for something that you can get for free? By using basic, white-hat SEO (search engine optimization) techniques, most businesses can easily dominate LOCAL searches for their products or services. There are tons of articles online about how to get your web pages to rank, so I won’t rehash that here. The important thing to remember is that is you have good content, a winning sales model that has a compelling hook and upsale opportunities you can’t go wrong. Save your money and ditch the Yellow Pages. Trust me, I am glad I did. Monthly budget for two phone books back in our bank account = $33,600 annually. It seems that Yellowpages salesmen have become a lot more aggressive lately (atleast in Canada) even though the phone book definitely doesn’t have the draw it used to. When I’ve spoken to them they’ve really pushed their online properties and have given large unproven numbers to promote it but I’ve seen almost no benefit from having online listings with them. People trickle in but there’s better ways to spend your money. I was a big fan of the yellow pages 20 years ago and having a business advertised on them although it was expensive, it was also quite compensating. Now days, i totally agree with you, it is a total waste of money. No one cares about the yellow pages anymore. Great thought, but I personally haven’t worked for a company that advertised in the yellow pages in such a long time. I can’t even say I know anyone who has been paying for these services in a long time.